Australia Post has released of a charity stamp to help raise funds for singing legend Olivia Newton-John ‘s new Cancer & Wellness Centre in Melbourne, offering tax deductibility to donors. Australia Post said this is the second time it has used this concept allowing people who purchase the stamp sheet to claim part of the purchase price as a charitable tax deduction. Australia Post first produced a special tax deductible stamp sheet to help raise funds for the Queensland floods in 2011. While Australia Post said this was a successful campaign it could not reveal how many stamps were produced or sold because of its ‘commercial in confidence’ issues. 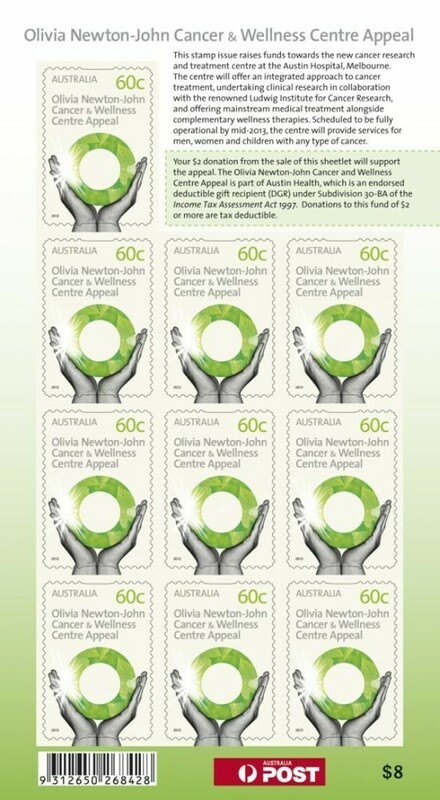 The Olivia Newton-John Cancer and Wellness Centre charity stamp, with a domestic rate of 60 cents, is available in a sheetlet of 10 with a face value of $6. The stamp sheets will sell for $8 to include a $2 donation to go towards the centre. A donation receipt is included in the sheetlet design for taxation purposes. An Australia Post spokesperson said the Olivia Newton-John Wellness Centre approached Australia Post some time ago about a charity stamp sheetlet and worked closely with the Centre on the design and distribution of the stamp through its retail outlets. “Charity Stamps are not part of the standard Stamp Issue Program and their inclusion in the overall program is currently being reviewed to see how they can best be aligned into our current program,” the spokesperson said. Australia Post said it hopes the initiative will generate substantial additional support from around the nation for the Cancer & Wellness Centre and increase awareness of the importance of its work. “This is a centre which integrates three elements – the world-class medical treatment of the Austin Hospital, the Ludwig Institute for Cancer Research and Olivia's dream of delivering the most thorough and individualised cancer treatments and care available,” Australia Post Managing Director and CEO Ahmed Fahour said. The Olivia Newton-John Cancer & Wellness Centre charity stamp sheetlet is available from participating Australia Post retail outlets while stocks last.